Returning from his visit to Fatima, May 12-13, 2017, Pope Francis held his traditional inflight “press conference” with journalists onboard the Papal plane touching on a wide range of issues. His pilgrimage to the Portuguese town for the centenary of the Marian apparitions marks Francis’ 19th Apostolic Visit abroad and his 28th country visited. The following is an unofficial transcript of the in-flight press conference on the papal plane returning from Fatima to Rome on May 13, 2017. Pope Francis: Thanks. Fatima certainly has a message of peace. It’s brought to humanity by three great communicators that were less than 13 years old, which is interesting. Yes, I came as a pilgrim. The canonization was something that wasn’t planned from the beginning, because the process of the miracles was in progress but the all of a sudden the export reports were all positive, and it was done – that’s how the story was told – for me was a very great joy. What can the world expect? Peace. And what am I talking about from now on with whomever? Peace. Pope Francis: The prayer, that, I did not write it… the sanctuary wrote it… but also I have tried because they said this, and there is a connection with the white. The bishop of white, Our Lady of white, the white glow of the innocence of children after Baptism and innocence… there is a connection to the color white in that prayer. I believe – because I did not write it – but I believe that literally they have tried to express with white that desire for innocence, for peace… innocence: to not hurt the other … to not create conflict, the same. Pope Francis: No, but that vision … I believe that then Cardinal Ratzinger, at that time prefect of the Doctrine of the Faith, explained everything clearly. Thank you. Claudio Lavanga (NBC News): Thank you. Holy Father, yesterday you asked the faithful to break down all the walls, yet on May 24 you meet a head of State who is threatening to build walls. It is a bit contradictory to your word, but he also has – it seems – opinions and decisions different from you in other topics, such as the need to act to confront global warming or the welcoming of migrants … Thus, in light of this meeting: what is your opinion of the politics that President Trump has adopted so far on these topics and what do you expect from a meeting with a Head of State who seems to think and act contrary to you? Pope Francis: Always there are doors that are not closed. Look for the doors that are at least a little bit open, enter and talk about common things and go on. Step by step. Peace is handcrafted. It is made every day. Also friendship among people, mutual knowledge, esteem, is handcrafted. It’s made every day. Respect the other, say that which one thinks, but with respect, but walk together … someone thinks of one way or the other, but say that …. Be very sincere with what everyone thinks, no? Pope Francis: I would toss out any form of triumphalism. None. Some days ago, the Feria Quarta of the Congregation for the Doctrine of the Faith, their meeting – the call it the Feria Quarta, because it’s the fourth Wednesday – studied a document and the document still hasn’t reached me, the study of the document. This is the first. Secondly, the current relations are fraternal. Last year, I gave a license for confession to all of them, also a form of jurisdiction for marriages, but even before the problems, the cases they had, for example, had to be resolved by the Doctrine of the Faith. The Doctrine of the Faith carries them forward. For example, abuses. The cases of abuse, they brought them to us, also to the Penitentiary. Also the reduction to the lay state of a priest, they bring to us. The relations are fraternal. With Msgr. Fellay I have a good rapport. I’ve spoken many times… I don’t like to hurry things. Walk. Walk. Walk. And then we’ll see. For me, it’s not an issue of winners and losers, it’s an issue of brothers who must walk together, looking for a formula to make steps forward. Pope Francis: There have been great steps forward, eh … we think of the first statement on justification, from that moment the journey has not stopped… the trip to Sweden was very significant because it was just the beginning and also a commemoration with Sweden… also there is significance for the ecumenism of the journey… that is, to walk together, with prayer, with martyrdom, with works of charity, with works of mercy. And there, Lutheran Caritas and Catholic Caritas have made an agreement to work together. This is a great step. But steps are always awaited. You know that God is the God of surprises. But we must never stop. Always go on. To pray together, to give testimony together and to do works of mercy together, that announce the charity of Jesus Christ, to announce that Jesus Christ is Lord, is the only Savior, and that grace only comes from Him. And on this path the theologians they will continue to study, but the path must proceed. And (with) hearts opened to surprises. Pope Francis: I’ll start with the first. I read in the papers that I peruse in the morning that there was this problem, but I still don’t know how the details are and because of this I can’t give an opinion. I know there is an issue and the investigations are moving ahead. I hope that they continue ahead and that the whole truth comes out. Medjugorje, all the apparitions, or the presumed apparitions, belong to the private sphere, they aren’t part of the public, ordinary magisterium of the Church. Medjugorje. Medjugorje. A commission was formed, headed by Cardinal Ruini. Benedict XVI made it. I, at the end of 2013 the beginning of 2014, I received the result from Cardinal Ruini. It was commission good theologians, bishops, cardinals, but good. Very good. And the commission. The Ruini report was very, very good. Then there were some doubts in the Congregation for the Doctrine of the Faith, and the Congregation judged it opportune to send each one of the members of this Feria quarta (Editor’s note: “Feria Quarta” is a once-a-month meeting in the Congregation for the Doctrine of the Faith during which current cases are examined) all the documentation, even those that seemed to be against the Ruini report. I received a notification – I remember it was a Saturday evening, late evening… and it didn’t seem right. It was like putting up for auction – excuse me the word – the Ruini report which was very well done. And Sunday morning the prefect received a letter from me that said that instead of sending them to the Feria Quarta, they they would send the opinions to me personally. 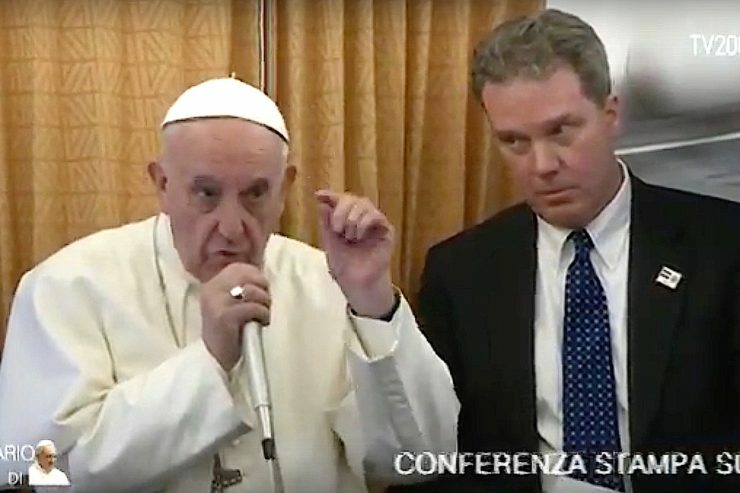 Pope Francis: Marie Collins explained the matter to me well, I spoke with her, she is a good woman, but she continues to work in the formation of priests on this point… she is a good woman who wants to work … but she made this accusation, and she has a bit of reason… why? Because there are so many late cases, then in this period of lateness, because they accumulate there, you have to make legislation for this… what should the diocesan bishops do? Today in almost all the dioceses there is the protocol to follow in these cases: it is a great improvement. This way the dossiers are done well. Then there are the accusations…this is a step. Another step: there are few people, there needs to be more people capable in this area, and the Secretary of State is looking for, even Monsignor Mueller (Editor’s Note: Cardinal Gerhard Ludwig Mueller, prefect of the Congregation for the Doctrine of the Faith), to present new people. The other day two or three more were approved… the director of the disciplinary office changed, who was good, eh, he was very good but he was a bit tired… he returned to his home country to do the same with his episcopate. And the new one is an Irishman, Msgr. (John) Kennedy, he is a very good person, very efficient, prompt, and this helps a lot. Then there is another thing: Sometimes the bishops send – if the protocol is okay, it goes right away to the Feria Quarta and the Feria Quarta studies and decides. If the protocol is not okay, it must go back to be redone. That’s why you think of continental help or in a continent or two … in Latin America, one in Colombia, another in Brazil, as pre-tribunals or continental tribunals… this is in the planning… but then it’s fine, they study it at feria quarta and they take away his clerical status. This goes back to the diocese, and the priest makes recourse. First, the application was studied by the same Feria Quarta that had given the sentence, and this is unfair. I created another tribunal and I put an indisputable person as the head, the Archbishop of Malta, Msgr. (Charles Jude) Scicluna, who is one of the strongest against abuses, and this second – because we must be just – the one who makes recourse is entitled to have a defender. If he (the defender) approves the first sentence, the case is over.His only option is a letter asking the Pope for pardon. I have never signed a pardon. I believe, I do not know, another question. This is how things are. We’re going forward. If Marie Collins was right on that point, we were also on the way. But there are 2000 cases piled up.